I designed and built the first SEAL for my nephew when he was old enough to start learning the basics of boating. Her sail rig is a sprit boom or leg-o-mutton as they were called here on the Chesapeake. This was the first boat I designed with this sail. I was impressed with its simplicity and effectiveness. No expensive store bought hardware was required. The arrangement between the boom and foot of the sail provided a self vanging effect to keep the boom from hfting. The sail can be set flat for strong wind conditions and controlled very easily. I have been sold on this rig ever sice. You will see it on many of my other boat designs. Construction is stitch and glue using plywood and epoxy built over frames. 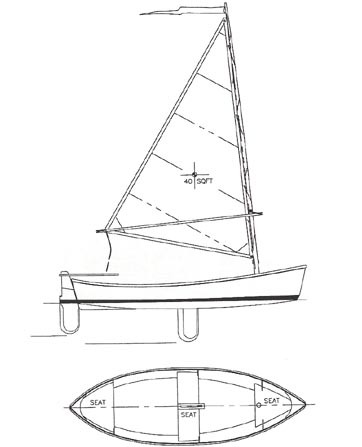 Plans include: dimensioned panels, frames, construction, and sail plan. No lofting is required. Estimated cost for quality construction materials (not including sails) is $900. This cost includes a high level of outfit and finish you can be proud of after putting the effort into building this fine boat. Purchase Study Plans for the SEAL for $5.00 for delivery by US Postal Service [no download file available]. Purchase Construction Plans for the SEAL for $55.00 for delivery by US Postal Service.